The leader of a non-governmental organization dedicated to wildlife preservation and forest conservation in Indonesia said a pulpwood company's plans to build a wildlife corridor in Sumatra surprised him - in a good way. The leader of a non-governmental organization dedicated to wildlife preservation and forest conservation in Indonesia said a pulpwood company�s plans to build a wildlife corridor in Sumatra surprised him � in a good way. 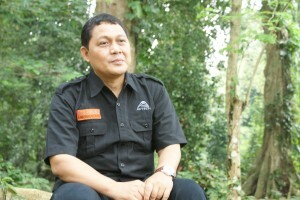 �We were so excited when WKS [PT Wirakarya Sakti], a licensed pulpwood company, expressed their idea to build a wildlife corridor to connect Bukit Tiga Puluh National Park with the protected area in the Taman Raja forest,� said One Earth Foundation Chairman Waldemar Sinaga. Sinaga is also pleased that other organizations continue to support the corridor, established on June 25, 2009, with a joint declaration by the Jambi provincial government, the Ministry of Forestry, a number of local non-governmental organizations and public figures from nearby communities. The corridor will be established on an ex-selective logging concession land between the Taman Raja Nature Preserve (TRNP) and the Bukit Tiga Puluh National Park, one of the largest areas of dry lowland forest remaining in Sumatra. The new conservation corridor will provide access to both conservation areas for Sumatran Tigers and other native species. Sinaga said public and private support for the wildlife corridor continues to grow and now includes multiple stakeholders, including Asia Pulp and Paper Group (APP) and another of its suppliers, Rimba Hutani Mas (RHM). Sinaga said the TRNP is an important habitat for many unique and protected species of plants and animals, including the sun bear, clouded leopard and Sumatran Tiger, as well as a crucial water catchment area for the local community. You are welcome Sue, Marianne and Melania. You cannot currently send a star to Angelika because you have done so within the last week. thanks for posting a positive news story coming out of Asia, very nice. I too hope it is true. Some good news is always appreciated. Noted - am absolutely thrilled that at least they are doing something for our fast depleting wildlife! You cannot currently send a star to Fiona because you have done so within the last week.